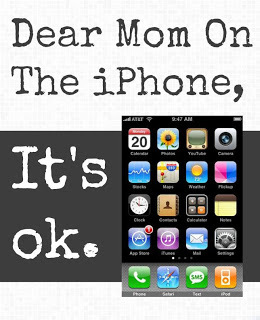 A few months ago there was a post circulating around the Internet (Click Here to read it) made to make us mothers feel guilty about using our iphones. Yes there are times when we should put the phone down and focus on the life going on around us but this post (Click Here) speaks to the fact that you cannot and should not judge someone or their actions without knowing the whole story. Thanks Mean from Fried Okra for writing this amazing post and helping us mothers who are already so burdened with guilt feel a little lighter. My question is: Why are you so burdened with guilt? You are doing the greatest job, you can, with the greatest gift you will ever be given! No room for guilt.